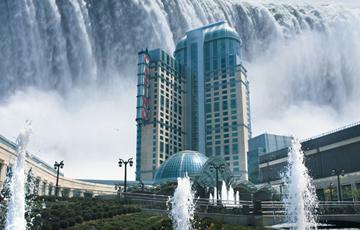 One of my favorite places to play casino games while in Canada is Fallsview Casino Resort in Niagara Falls. There are actually two casinos in Niagara Falls – Casino Niagara and Fallsview – but I prefer the latter much more. It’s newer. It’s more inviting. It feels like it’s built for high rollers. And it’s very welcoming, even for non-gamblers, with a gorgeous $10 million fountain simulating the energy of the falls when you walk in and an even more impressive view of the falls from the exterior of the building. But it didn’t feel so welcoming on Thursday, June 5th during the lunch hour. At 1:14pm local time, a call came in to 911. The caller said he lost a lot of money gambling at Fallsview Casino and he was heading there to do some harm. Scary stuff if you were the police, especially with what happened in Moncton last week (in case you were sleeping under a rock, someone shot and killed three others, and wounded a few others, in a peaceful New Brunswick town – totally out of character for our neighbors to the north). And even scarier stuff if you happened to be inside Fallsview Casino. As a precaution, the police locked down the premises. No one could leave, unless they were departing by bus and their bus was scheduled to depart at that time. People were allowed to leave and enter the casino after around 3pm, but we’re not sure how many people entered the casino as planned. I know most people would get the heck out of dodge after finding out that someone claimed there were on their way over to do some damage, even if the police concluded that it was a false alarm. Personally, though, I’d probably stay. Casinos are one of the most secure places on the planet. While you might not notice a police presence, you’re being watched at all times (except maybe while in the bathroom, but even then, who really knows). The eye in the sky is famous for tracking your every move. With millions of dollars in play on the tables and at the slots at one time, casinos have a lot riding on being able to not only track criminal activity as it happens, but also being able to pinpoint crimes that are about to happen. That said, maybe playing online at places like Silver Oak Casino is a bit safer. Not only do you not have to worry about disgruntled gamblers getting revenge on the casino in your presence, but there are also systems in place to prevent gamblers from losing their shirt. There are deposit limits in place so you can’t lose more than you can afford to. And if we suspect problem gambling, we’ll do everything in our power to put a stop to it.